Recently, I found the softest, coolest old quilt at a garage sale. 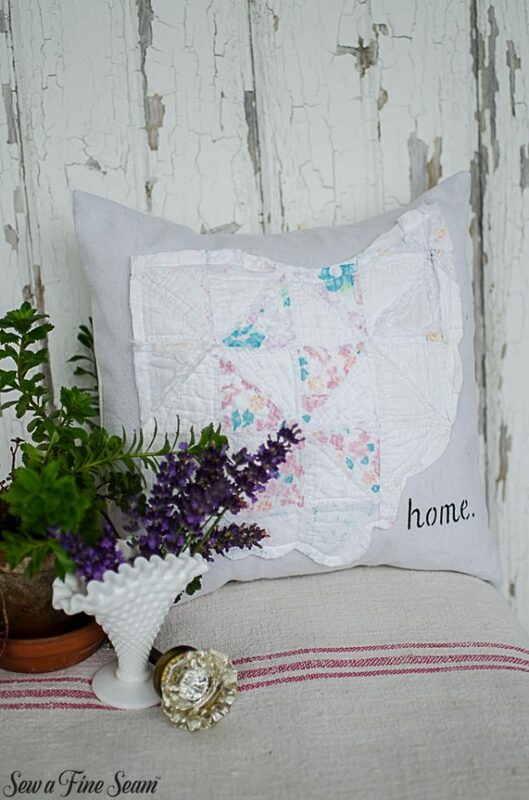 This quilt had already become a cutter as someone had cut parts from it to create something. So I used a bit more of it to cut out the shape of Ohio. I just LOVE this one – I may have to keep it! I rarely keep one of my own pillows. They all just end up at the shop or in the load to go to a show! 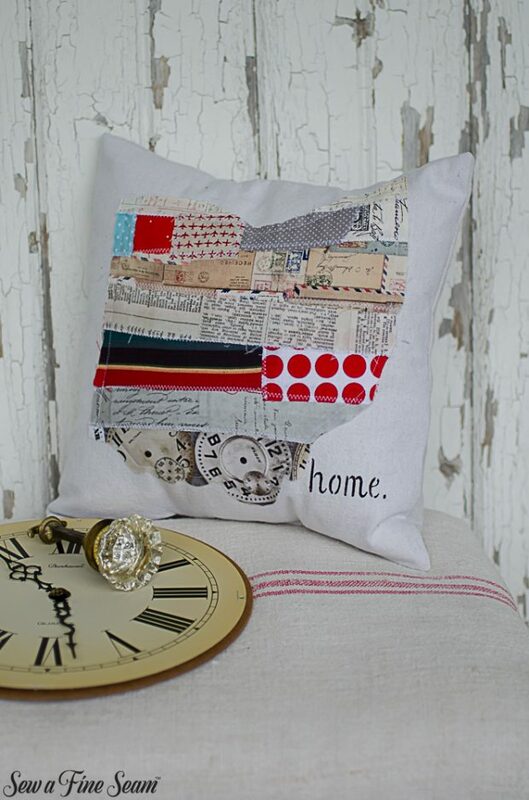 I think this one almost looks like the fabric was made with this mashup of prints instead of put together by hand! 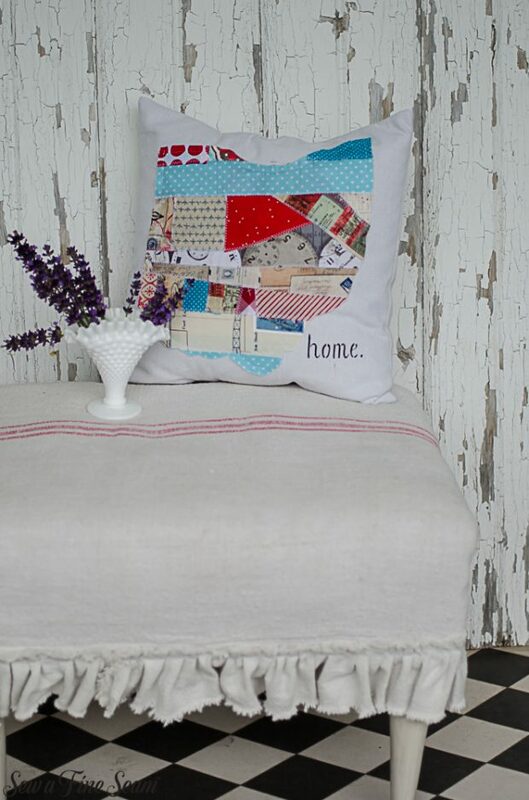 Patchwork is seriously so much fun to do! It’s a bit time consuming, but it’s fun. 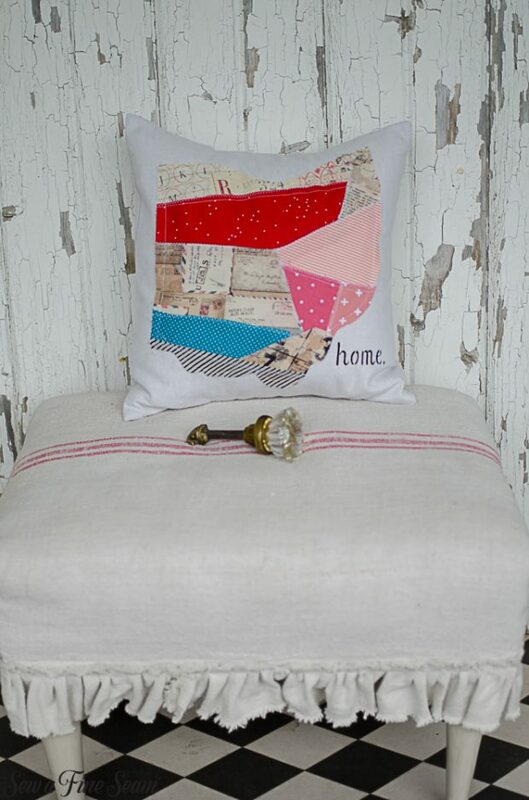 Piecing fabrics together that might not have been meant to be together and creating something unique makes me smile. A big reason I love these is the fact that all the fabric would have otherwise ended up in the trash! 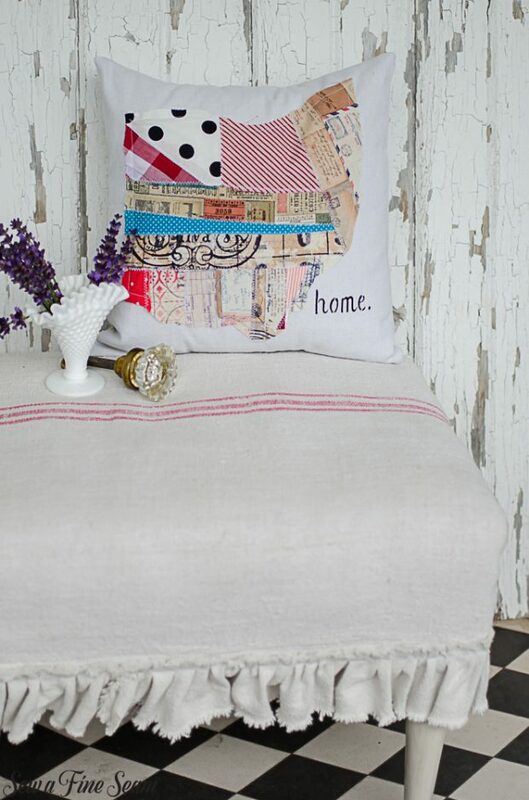 Instead of sending it to the landfill, it became cute, fun pillows! This one is a favorite too. I love the coral and neutral colors. My next event is The Summer Market in Avon Lake Ohio. 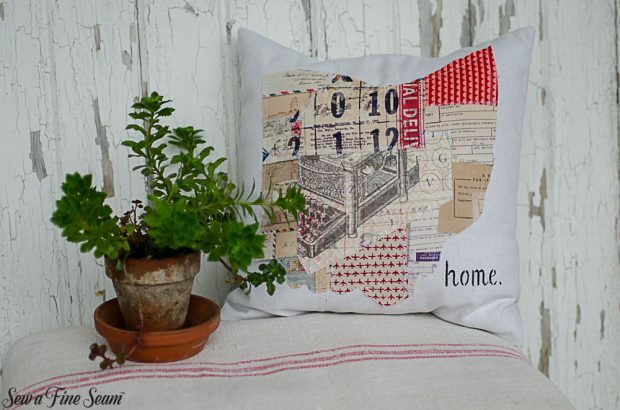 I’ll have patchwork Ohio pillows with me there! 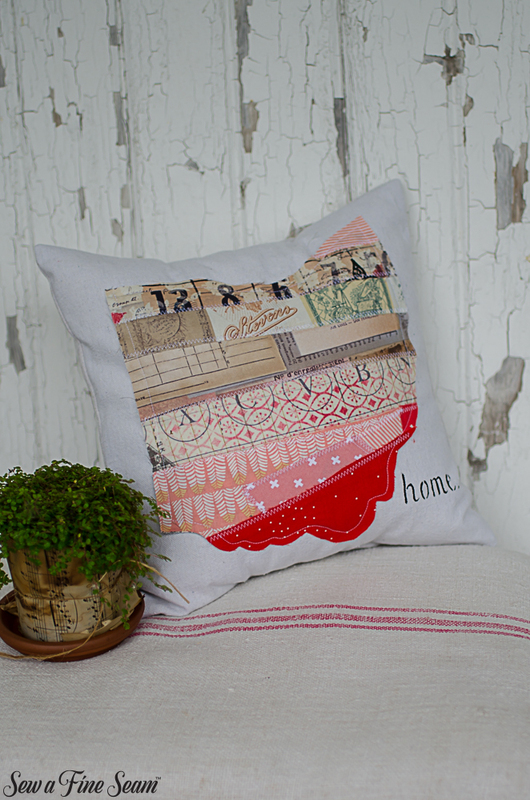 How did you stencil the word “home” on your pillow? 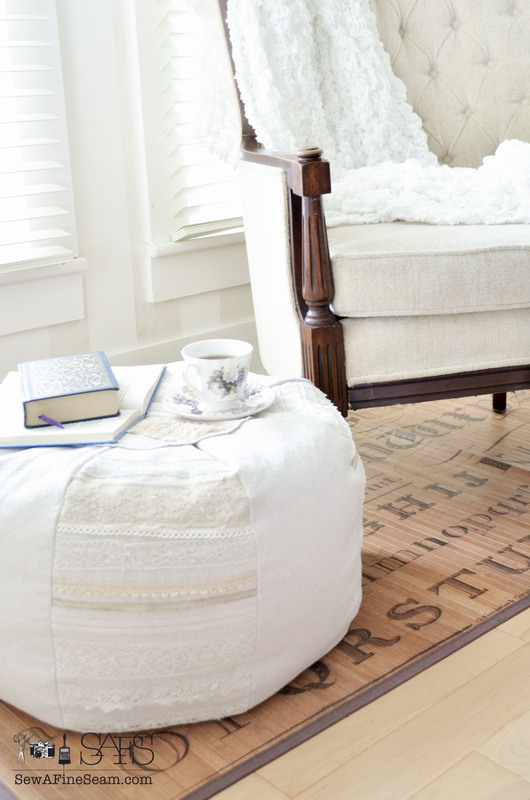 I remember a bingo bag you stenciled a while ago but don’t remember how it was created. 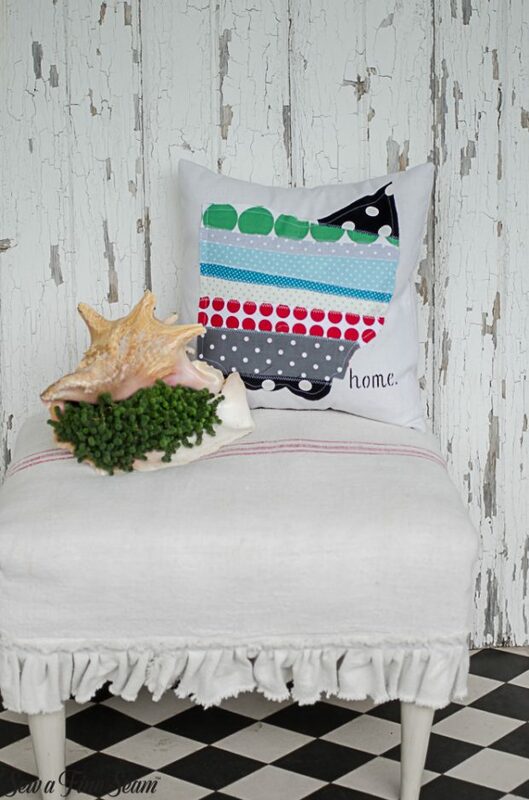 These pillows are adorable! I use stencils for my pillows and handbags. The bingo stencil is one I bought from Old Sign Stencils. The home I made myself. Jill love your new photo, you look prettier than ever.Looks like you have your hair shorter, great look. 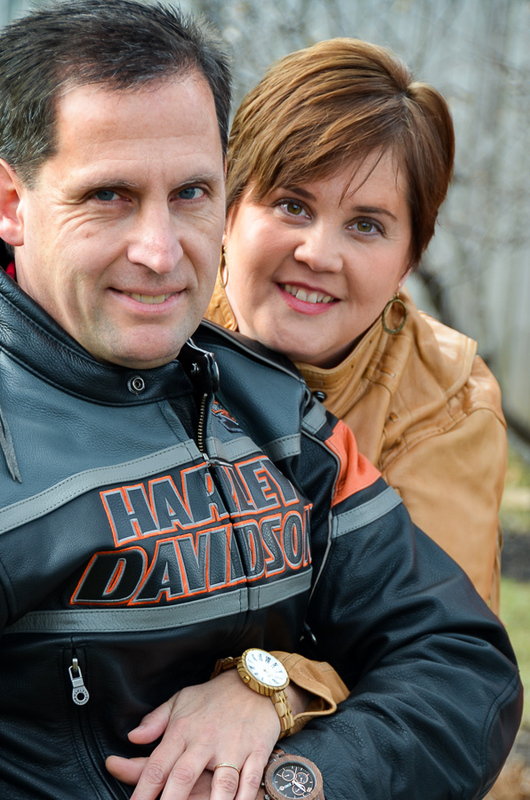 Hope kids ad hubby are all doing great,kids getting more grown up. 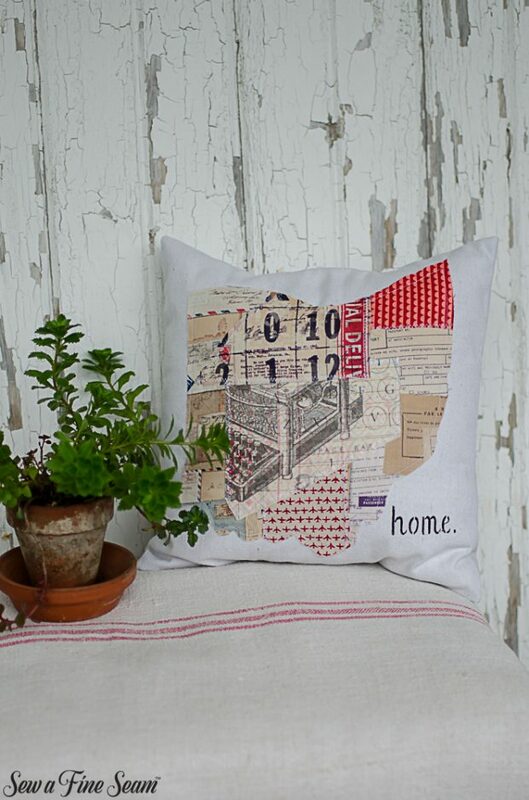 Love your Ohio pillows, very cute and specialized which is always good for Ohio folks. You just keep getting better and better, so many new projects done beautifully.Was good to hear from you and see your updated photo. Keep up good work and enjoy rest of weekend. HI JaneEllen! Great to hear from you again! My oldest graduated high school this spring and the other two are fast approaching high school! They will be in 6th and 8th grade this fall. I love my hair short – it’s so easy to take care of! My daughter took the pic of me after her graduation party. I’ll post some pics of her party as soon as I can find some time to get it done! Hope your week is off to a great start. What will your graduate be doing come Sept? Will she be going to college? Darned kids grow up too fast don’t they? When we moved here in 2004 our grand daughters were still little. Now youngest is going to be senior in high school, gets awesome grades. Oldest will be junior in college to be special needs teacher. Grandsons are grown up, youngest lives in San Diego with his dad just got his first job and his brother took furlough from college in KY to work at a chemical engineering job. He’ll go back to college in January as Junior. Our oldest grandchild/daughter is living in Aspen with her boyfriend. She left home not too long after her brother died of cancer, last June 8,2016. Never hear from her, her Mother did good job poisoning her against us. Rarely get to hear from or talk to my son, his wife has fit if we call, she has a real problem, always has since we don’t have money and we know about her cheating on my son when their son first got sick. My son was working in Singapore almost all summer. We just hang out at home doing our thing. Took me long time to deal with grandsons death as we were shut out of even getting to go to his celebration of life. Was more to raise money than anything. We heard about his dying on Facebook. Love your short hair cut photo, looking good gal. Take care. Love these! So fun all the creativity! Thank you so much! The patchwork is really fun to do!